Leukomed T Plus combines an ultra-flexible and thin profile film dressing with low adherent wound pad for secure absorption and excellent wearing comfort. It securely protects against water, bacteria and viruses and helps to reduce the risk of surgical site infections. The low profile film and the strong adhesion allows the dressing to stay in place for longer enabling less dressing changes and decreased risk of wound contamination. 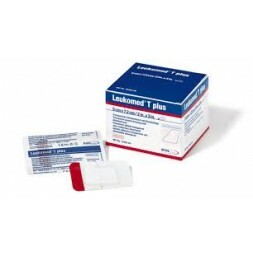 Leukomed T Plus is easy to apply with a unique red tab allowing for easy and precise application helping to reduce the risk of infection. The absorbent and breathable dressing allows the secure uptake of exudate helping to reduce the risk of skin maceration and blistering. The absorbent wound pad allows for reduced number of dressing changes – less effort, cost and time – less stress on the skin. Leukomed T Plus offers protection absorption for surgical incisions and to cover and protect superficial cuts, lacerations and minor burns. It is a water, bacteria and virus proof dressing, and effectively helps to prevent infections.